Pulissery is a thick sour curry recipe made with yogurt, coconut and any vegetable like yam, ripe mango, ripe plantain etc. Mambazha pulissery is a very popular pulissery recipe for onam sadya or vishu sadya which makes us drool. This sweet and sour curry tastes heavenly delicious for sure. Sadhya, a vegetarian feast served in banana leaf consisting of a variety of dishes prepared during special occasions like Onam, Vishu, weddings in Kerala. For sadhya, steamed rice is the main dish which is accompanied by several dishes (koottan) like sambar, rasam, pulissery, erissery, kalan, olan, pachadi, kichadi, koottukari, aviyal, thoran, pickle, pappadam, payasam etc..Here am sharing the recipe of pulissery which is sweet and sour. Ripe mangoes are used for this pulissery recipe especially small nattu manga (small ripe mangoes). 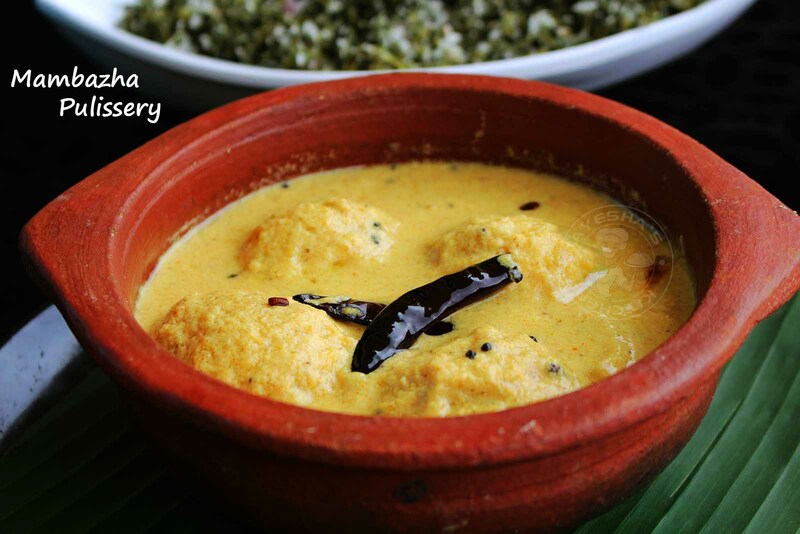 A must try Kerala sadhya recipe. I prefer small nattu manga (small ripe mangoes) for this recipe. If so, peel the mangoes and use the whole mango for the recipe. Or if using big ripe mangoes, chop them into medium-sized pieces. Add the ripe whole mangoes in a vessel or manchatti along with turmeric powder, chilli powder, pepper powder and salt. Add half a cup of water and bring it to boil over a medium flame. Cook until the mangoes are done. Stir occasionally. When done, add sugar and mix well. Once the mangoes are done, add the grounded coconut mixture to it. Mix well. If you need thin consistency, then add water now(optional). Cook until the bubbles start. Do not let it boil. Check for salt. Remove from flame. Heat a pan with oil. Splutter mustard seeds, then add fenugreek seeds (uluva), dried red chilies, curry leaves and fry until done. Pour this over the prepared pulissery or kalan. Cover and serve after few minutes. Delicious mambazha pulissery / mambazha kalan ready.